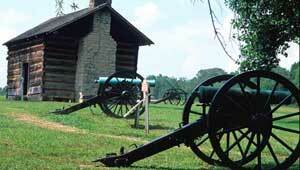 TPL has helped protect significant historical resources in Chickamauga National Military Park. In February 2001, TPL acquired the 24-acre Ruby Falls tract on Lookout Mountain, an important inholding of the Eastern battlefield offering spectacular views of historic Moccasin Bend, Missionary Ridge, and distant Cherokee Forest. This land and other key properties on the mountain have been secured using Title V and LWCF funds and transferred to the National Park Service. In 2008, TPL helped the park acquire 328 acres from the CSX Railroad Company in Lookout Valley west of Lookout Mountain. The latest addition was made possible with support from the federal Land and Water Conservation Fund. As the nation marks the 150th anniversary of its great civil conflict (1861-1865), TPL celebrates Georgia's Resaca Battlefield, the latest of many TPL Civil War conservation projects including Morris Island, in Charleston Harbor, and Murphy Farm at Harpers Ferry, West Virginia.